I've promised myself one little thing at each market and Huz beat me to it, but its lovely. So me, and just what I needed. Bus tickets just weren't cutting it! Glad you had a lovely day. Funny I shared a market with the Bonsai Tree way back in March. And, guess what I came home with? 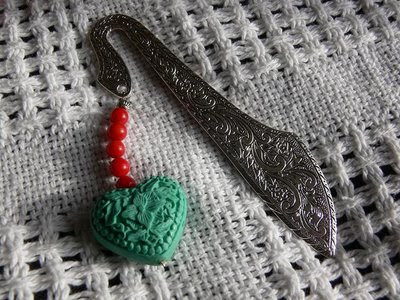 One of her lovely bookmarks! Gorgeous - I agree! Glad you like the bookmark. Thanks for the nice comments. If my memory serves me correct Edwina's bookmark was exactly the same! Wow, this is gorgeous. I didn't get what it was at first. But once I did, I realised how pretty it was!